The Chapel Hill High School Tigers fell 1-0 off a penalty kick to Marvin Ridge High School in the 2016 3A men’s soccer championship. It was a tough lesson that led to a new mantra: never get outworked. The Tigers look to redeem themselves in the Fall 2017 season. Team chemistry is better than ever with most of the players returning from the previous season. It is the perfect recipe for a redemption year. The Chapel Hill High School varsity men's soccer team does their final cheer before a home game against Cedar Ridge High School on Sept. 11, 2017. The Chapel Hill High School varsity men’s soccer team huddles up before their home game against East Chapel Hill High School on Oct. 20, 2017. Junior midfielder Max Ring (3) speeds past a defender during a home game against Cedar Ridge High School on Sept. 11, 2017. Coach Curtis (left) and Coach Boyle (right) debrief the team after their 3-1 win at home against Cedar Ridge High School on Sept. 11, 2017. Junior forward Kevin Morales (15) mentally prepares for an away game against East Chapel Hill High School during the bus ride to the game on Sept. 22, 2017. 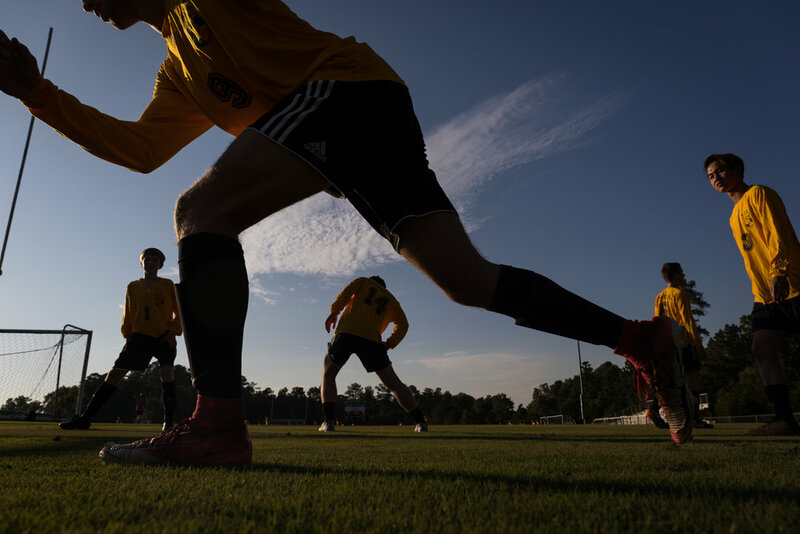 The team does their pre-game stretch routine before their away game against East Chapel Hill High School on the late afternoon on Sept. 22, 2017. 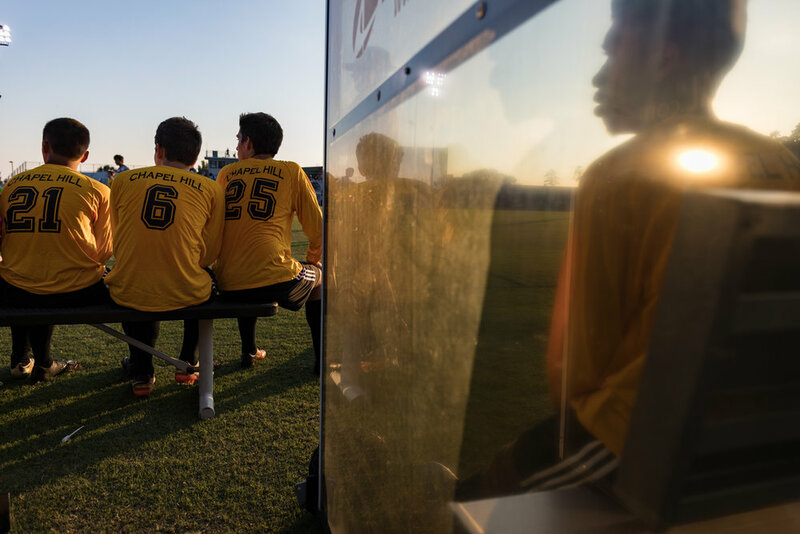 Members of the team sit on the bench during kickoff against East Chapel Hill High School during an away game on Sept. 22, 2017. Sophomore goalkeeper Matt Wolf (0) celebrates with the Chapel Hill High School flag after a 3-1 win against rival school East Chapel Hill High School on Sept. 22, 2017. Senior defender Ulises Ramirez (5) walks towards the bus after getting Bojangles with the team in celebration of their 2-0 win at Northwood High School on Oct. 9, 2017. 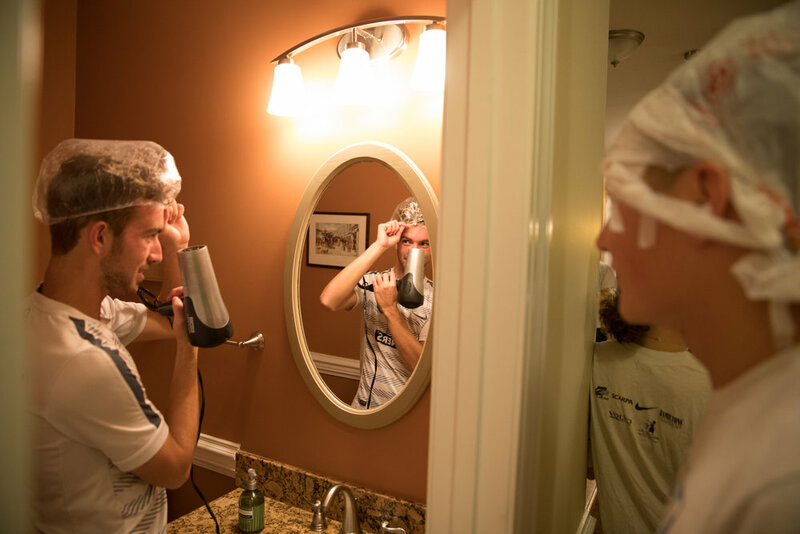 Junior defender Ryan Smith (9) bow dries his hair after getting it highlighted at a teammate’s house on Oct. 30, 2017. It is tradition for the team to get their hair highlighted before the start of the playoff season every year. 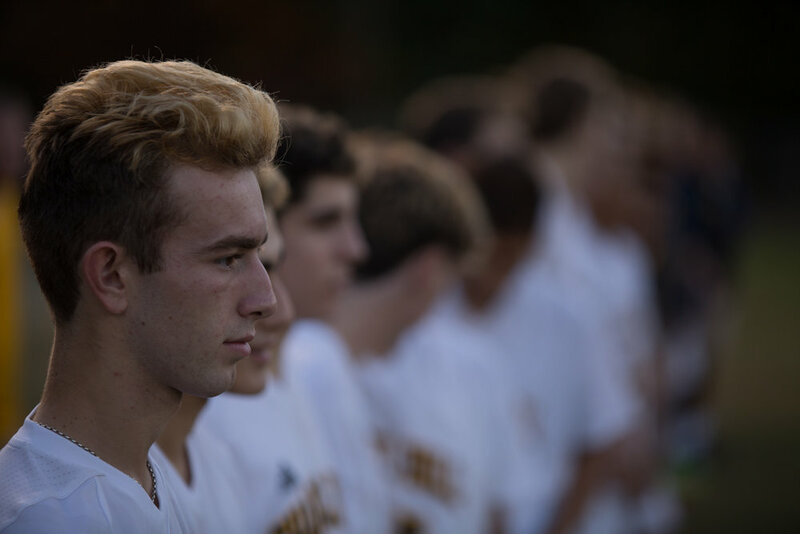 Junior defender Ryan Smith (9) stands in line during the playing of the national anthem before the team’s first playoff game at home against West Johnston on Nov. 1, 2017. The team breezed by with a 3-0 win. Senior defender Juan Castro (left) hypes up junior midfielder Max Ring (right) before going into overtime at home against rival school East Chapel Hill High School on Oct. 20, 2017. Chapel Hill High won 1-0 in their last regular season game. 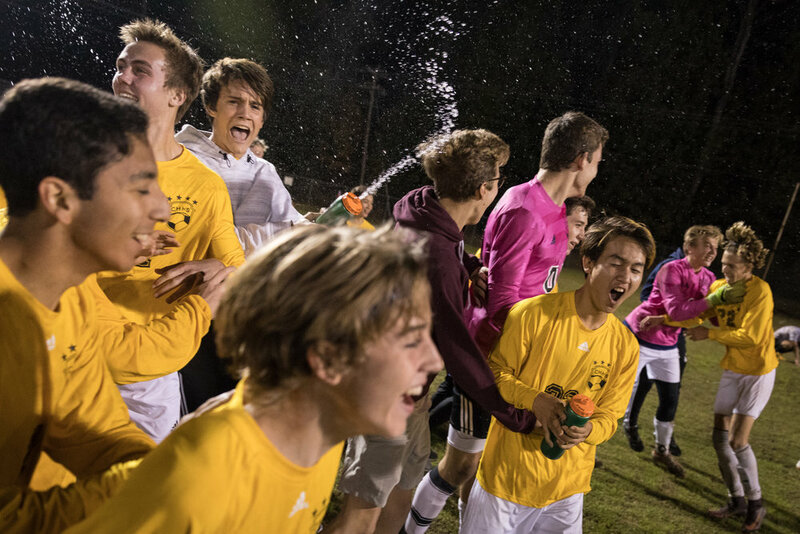 The team celebrates after their 1-0 overtime home win against rival school East Chapel Hill High to finish the regular season on Oct. 20, 2017. The team went 2-0 against their rival during the Fall 2017 season. 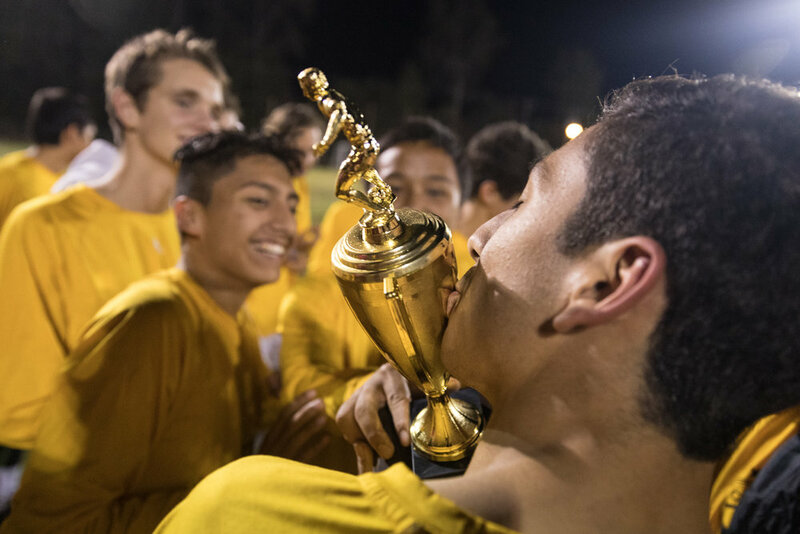 Senior midfielder Richard Vaca (17) kisses the Big Eight 3A conference champion trophy after a 1-0 overtime win against East Chapel Hill High School at home on Oct. 20, 2017.